Over the years, I have been truly blessed to get the opportunity to travel across the US and chronicle all the strange and spooky things that I encounter. What’s more, publishers have been willing to take my ramblings and photographs and pass them along to all of you. It’s something that still boggles my mind. When I was much, much younger, I came up with the idea that by the time I was old and grey, I wanted to be able to leave something tangible behind as my legacy. Something that people could hold in their hands and literally feel. And now, thanks to so many people believing in me, I’ve accomplished that. And to all of you out there who have taken the time to purchase one of my books or check them out of your local library, I’d like to say “thank you”. For this book, I took a step back from Ohio ghosts and instead decided to focus on strange and just plain weird bits of historical event and people in and around Central Ohio. Don’t panic, though, as there are a couple of ghost stories, including a really cool one where I try to tie together literacy history and the supernatural at the former home of author James Thurber. But that story is mixed in with tales of Johnny Appleseed, Annie Oakley, a couple of convicted Ohio murderers, Buckeye UFOs, Grassman, and even an underground fire that’s been burning strong for over 100 years and counting! Released in October of 2015, this is the book I have always wanted to write! Over the years, I’ve noticed that many of Ohio’s historically significant locations have developed a reputation for being haunted. While it might be almost impossible to prove the validity of the paranormal tales that surround them, one thing is clear: ghost stories help to keep history alive. But the questions remain: How did these stories get started? More important, are any of them tied directly to actual historic events? And do any facts support the ghost lore? Rather than rely on second- and third-person accounts, I sat down with the owners, employees, and patrons of Ohio locations that are said to be haunted—the Arts Castle in Delaware, the Fairport Harbor Marine Museum, the Haunted Hydro in Fremont, Loveland Castle, the Merry-Go-Round Museum in Sandusky, the Ohio State Reformatory in Mansfield, the Zanesville Community Theatre, and many others. After conducting more than 200 hours of one-on-one interviews, I was able to piece together unique histories for each location, including eyewitness accounts from people who believed they experienced paranormal activity. But I wasn’t content to stop with first-person accounts. I also brought high-tech “ghost-hunting” equipment into each location and spent a night attempting to collect empirical data to see if I could experience a paranormal encounter himself. What were the results of these vigils? You’ll have to read the book to find out! Come along on a journey with me as I travel to the crossroads where history and folklore collide, and visit the fascinating Ohio locations where the past comes alive—in more ways than one! Released on September 1st, 2013. Boy, was this a fun one to write! 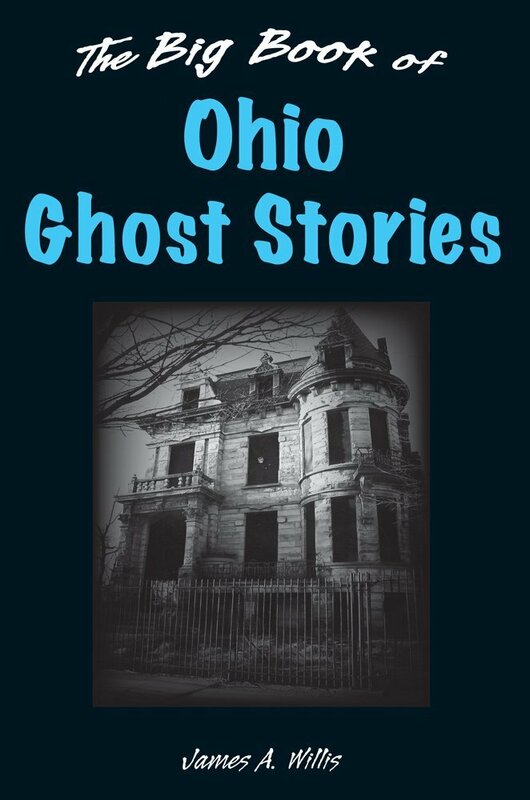 Having spent most of my career attempting to validate hauntings, the Big Book was an opportunity to simply catalog some of Ohio’s most popular and enduring ghost stories without getting having to “prove” a thing! In other words, the book became a who’s who of Ohio’s specters, including such long-standing legends as the Athens Stain, Franklin Castle, and of course, Hell Town! 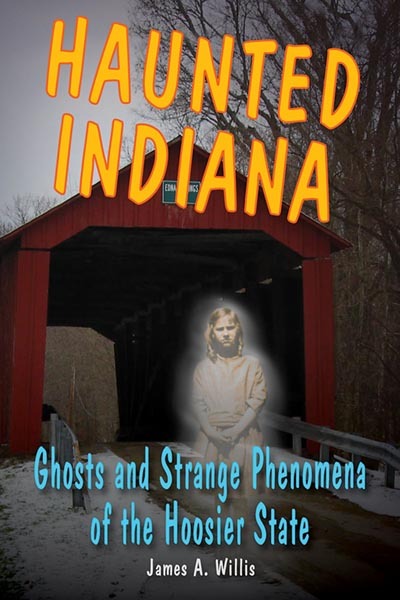 2012 started off great for me with the publication of Haunted Indiana, the first book to feature my name, and my name only, on the cover. Having spent some time researching some of the Hoosier State’s ghost stories for Weird Indiana, it was fun to roll up my sleeves and really take a close look at the spooky side of the state. What I found was that while Indiana does not have as many ghost stories as some other states, the ones they have tend to be a lot darker and creepier! My personal favorites, just for the sheer weirdness of the tales, are Purple Head Bridge and Dog Face Bridge. From a historical perspective, House of Blue Lights is a good one. And the legend of Okie Pinokie gets a nod just for having such a weird name associated with it! The latest anthology of tales from Armchair Reader that I was asked to contribute to. 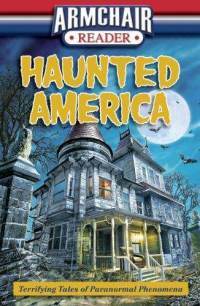 Haunted America features over a dozen authors, all coming together to write about haunted places across the United States. Since this is an anthology, none of the authors’ names appear on the cover (we’re all listed at the back of the book, though). The individual articles don’t have author names attached to them, either. But some of the articles I worked on included such infamous haunted locales as Mansfield Reformatory, Bobby Mackey’s, Waverly Hills, and Eastern State Penitentiary. I even contributed an article about the famous figures in ghost research. And I was especially honored to be considered the “ghost expert” and asked to answer some FAQs about ghosts in Q&A articles such as “What Are The Different Types Of Ghosts”. Another great addition to the Weird U.S. series. Mark Moran and Mark Sceurman gathered up the Weird Writers and had us all spin some spooky yarns about our favorite haunted hot spots. Since there were a lot of us, we aren’t listed on the cover (we’re all listed in the back), but author names are attached to the individual stories so you can tell who wrote what. This was a fun book for me to work on in that I was able to work outside of my traditional stomping grounds in the Midwest. So while I was sure to include Ohio locales like the Elevator Restaurant, King’s Island Cemetery, and Fairport Harbor Lighthouse, I also contributed stories like San Diego’s El Campo Santo and New York’s Marist College. This book was a blast to work on! 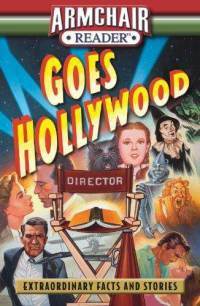 I contributed literally dozens of stories about the strange and spooky side of Hollywood; everything from the dark history of the Hollywood sign to the most haunted places in Tinsel Town. Again, as a contributing writer, you’ll need to flip to the back of the book to find my name. And since author names aren’t associated with the individual stories, you’ll have to just read them all to find which ones have my “voice”. But if you want a couple of hints, some of my contributions include Hollywood’s Urban Legends, TV Shows That Became Movies, Joan Crawford, The Bizarre Films of William Castle, The Curse of Billy Bob Thornton, and even articles about the most expensive movies ever made and how to get your very own star on Hollywood’s Walk of Fame. 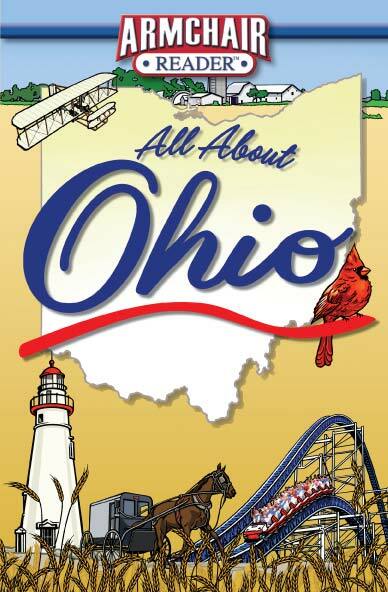 One of three books I could collaborate on with Armchair Reader, All About Ohio was considered a “mini” in that it had 1/2 the content of the other Armchair Reader books. Still, I, along with the other writers jammed this book full of all sorts of little-known facts and stories about the Buckeye State. As with all the other Armchair Reader books I worked on, my name does not appear on the cover and there are no bylines for the individual stories (but my mini-bio is at the back of the book). But there is plenty of my stories to go around, including ones about the Serpent Mound, Franklin Castle, Gore Orphanage, the shipwrecks of Lake Erie, Ohio’s Weirdest Beer Names, Ohio’s connection to the Hollow Earth Theory, and two of my all-time favorite Ohio stories/legends, the Loveland Frog and Ohio’s headless motorcycle ghosts. I even worked on a bunch of detailed lists, including a list of oversized roadside oddities and some famous Ohio inventors. 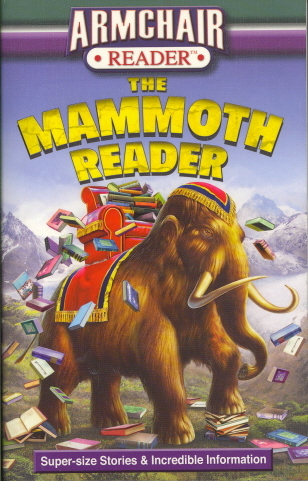 Of all the Armchair Reader books I’ve worked on, The Mammoth Reader was the most fun to work on. That’s because the editors basically came to me and said “what do you want to write about?”. In other words, while I had to submit a proposal listing all the stories I’d like to write, I was free to submit stories on any topic I wanted. How cool is that? For this book, I was all over the place, covering diverse topics such as the Crystal Skulls, the curse associated with the Little Rascals, the failed plot to steal Abraham Lincoln’s corpse, and the history of the Pony Express. Even the detailed lists I put together were a bit out there, with my two favorites being one about weird flavors Pepsi has created over the years and one chronicling bizarre food items that have shown up on fast food menus. But hands down, my favorite story was the one I wrote about the Red Special, the handmade guitar built by Brian May, legendary guitarist of the band Queen. IMHO, Queen is the greatest rock group in the world and I have been attempting to convince the world of this since I became a fan in 1975. I even went so far as to e-mail Brian May, letting him know I wrote the article and how much Queen’s music had meant to me over the years. He never wrote back, which was a little depressing. Not as depressing as when I found out Queen was planning on touring with Adam Lambert, but depressing just the same. 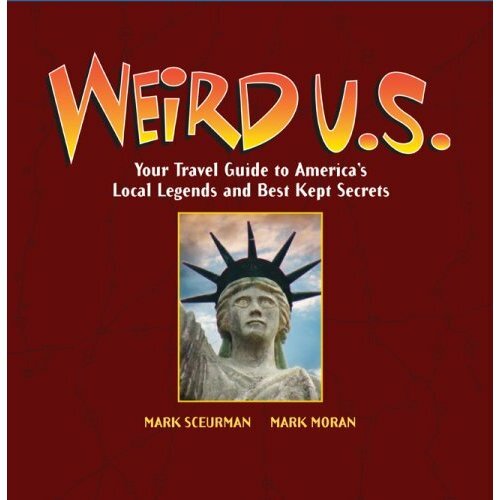 This could be considered my follow-up to Weird Ohio in that Mark Moran tapped me to co-author this after discovering what he called my “Weird Eye” during the creation of Weird Ohio. 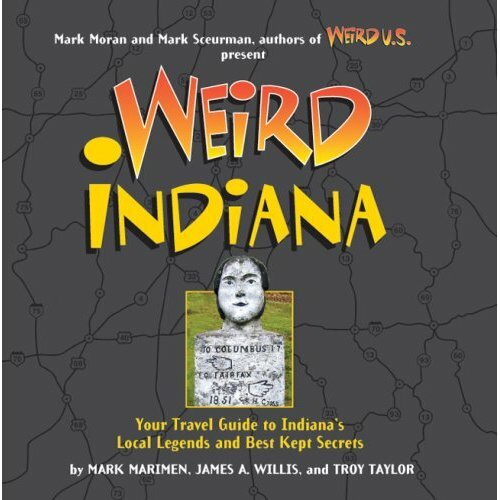 With so many ghost stories to share between Mark Marimen and Troy Taylor, for Weird Indiana, the vast majority of my time was spent focusing on Roadside Oddities and other weirdness in the land of the living. My proudest moment with this book has to be the cover, which features my photo of a location I literally stumbled across. The image gracing the cover is that of a stone head, which is located in the town of…wait for it…Stone Head. Yup, that’s right, the town was named after a head carved in stone. In terms of my favorite story in Weird Indiana, it has to be the Blue Flash, a homemade roller coaster that features a 360-degree loop. At certain special presentations, I’ve been known to throw in the video of me riding the Blue Flash, which I’ve heard makes sitting through my presentations totally worthwhile! On the heels of the enormous success of 2004’s Weird US, the follow-up, The ODDyssey Continues, was released in 2008. I was a contributing author to this book, meaning you’ll have to turn to the back to find my name. Some of the stories I wrote were The Giant Madonna of Windsor, Cincinnati’s Spring Grove Cemetery, Indiana’s Dollhouses of the Dead, Albino Animals & Swallowed Objects, and The Ultraviolet Apocalypse. Of course, I couldn’t be prouder that I was able to once again cover the Big Butter Jesus (RIP) for the book, too. This was the first book I worked on in the Armchair Reader series. 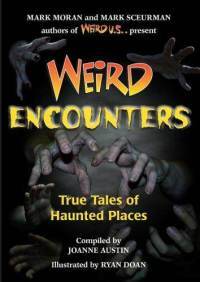 And while my name does not appear on the cover (it’s in the back with all the other contributing authors), I did receive a “special thanks” at the beginning of the book for being “extra weird, scary & unusual”. My friends and family still kid me about that one! Author’s names are not assigned to individual entries, but I contributed dozens and dozens of stories. Some of my favorites are Bachelor’s Grove Cemetery, The Legend of the Jersey Devil, Boot Hill Cemetery, The St. Valentine’s Day Massacre, The Death of Bonnie & Clyde, and of course, Ohio’s Loveland Frog. As with all the Armchair Reader books I worked on, I also contributed a bunch of detailed lists. For Weird, Scary & Unusual, my favorites were a list of the most haunted restaurants in the US and another list of famous people who faked their own deaths. 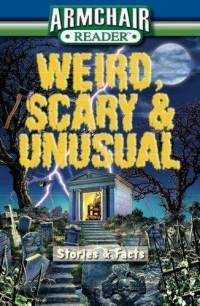 I don’t know about the other books in the Weird US series, but when I was writing Weird Ohio, there were so many ghost stories that there was no way we could cover them all for one book. 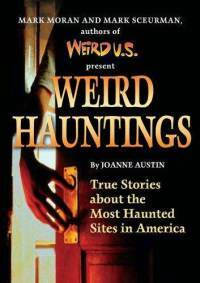 Thankfully, I was able to cover those stories in 2006 when Weird Hauntings was released. With editor extraordinaire, Joanne Austin, at the helm, several Weird Writers were assembled and asked to pen some of their scariest tales. Some of the stories I contributed include Kenyon College, The Legend of Lick Road, and The Golden Lamb. Here it is: the book that brought Weird Willis to the world! To say that writing Weird Ohio was a wild ride would be a gross understatement. Because it was actually many, many wild rides! Essentially, I would spend every Friday evening packing Ol’ Blue, my car, with supplies. At the crack of dawn on Saturday, I’d throw a couple of friends in the car, gas up, and head out for a whirlwind tour across Ohio, returning home in the middle of the night on Sunday. In terms of what I covered, I started off with my forte, ghosts and urban legends. When those were done, I set out to cover bunches and bunches of the roadside oddities. 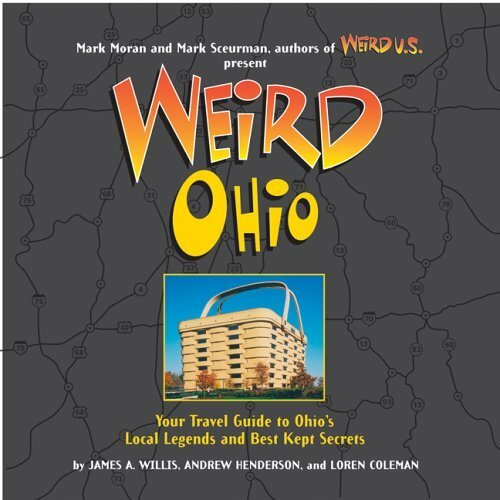 I wrote entire sections of Weird Ohio while recovering from emergency gall bladder surgery. I met my wife, Stephanie, while writing Weird Ohio. In fact, one of our first unofficial dates was a visit to Cedar Hill Cemetery. That date is immortalized on page 240 of Weird Ohio, where you can see Stephanie listening for “muffled voices and screams from tormented souls” at the door of a mausoleum (she’s also wearing my jacket and Philadelphia Flyers hat). It was while researching Weird Ohio that my unhealthy obsession with The Boy with the Boot began. I am the proud owner of the original Ryan Doan artwork for the Troll Bridge that appears on page 80. A lot of people think that my weirdness (at least in print form) began in 2005 with Weird Ohio. But it actually started 2 years before that, when I received an e-mail from Mark Moran from Weird NJ, asking for more information about my exploration of the infamous Hell Town. You see, unbeknownst to me, my 2002 public debunking of the vast majority of urban legends swirling around the area known as Hell Town had made me a bit of a household name. It also caused me to be nicknamed “The Man Who Debunked Hell Town”, a moniker that still with me today. Long story short, Mark wanted to know if I would contribute an article on Hell Town to a book he was planning with fellow Weird NJer, Mark Sceurman. Mark (Moran) said the plan was to create a gorgeous, full color book (hardcover, no less) that they could sell for under $20. I agreed, thinking to myself “there’s no way they’re going to be able to pull this off.” Boy, was I wrong!